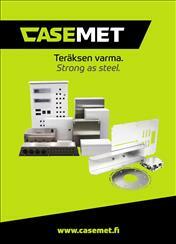 Our wide product offering includes steel enclosures and spare parts. Our solutions are designed for harsh and demanding industrial environments to meet the requirements of protection and extreme endurance. We offer high-quality standard enclosures as well as customized and tailor-made enclosing solutions. Our customer oriented service includes both customizing standard enclosures and customer & project spesific enclosing solutions. In addition we offer tailormaking services containing 3rd party component outsourcing.